The architects sought to emulate some of the qualities of Austin’s classic bathhouses at Barton Springs and Deep Eddy. Photo by Paul Bardagjy. There are gardens inside the bathhouses, which are open to the sky. 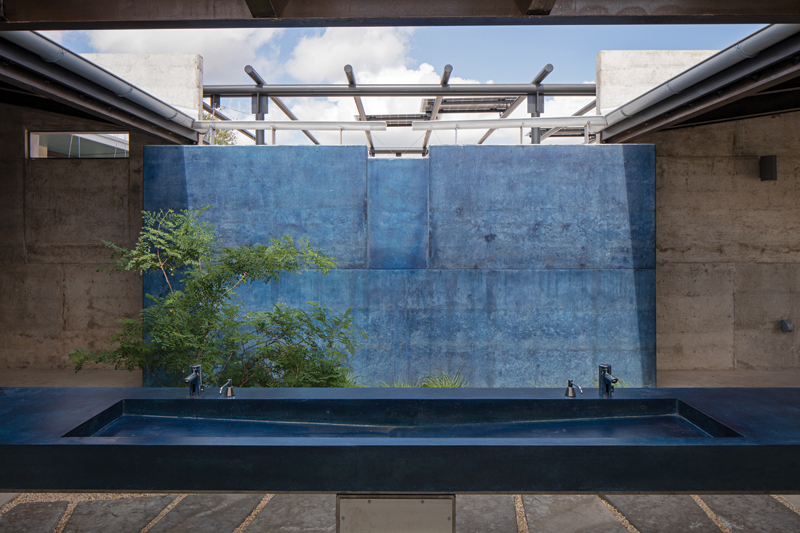 Cisterns, rendered in blue-stained concrete, capture the runoff from the roof. Photo by Paul Bardagjy. Stanley designed and fabricated the gates and other ornamental metal work in the project. Photo by Paul Bardagjy. The concrete picnic tables are stained the same blue as the cisterns in the bathhouses. Photo by Paul Bardagjy. The playground features earth berms in the shape of the old airport’s runways. Photo by Paul Bardagjy. he old flight tower is one of the few architectural remnants of the Meuller neighborhood’s former function. Photo by Paul Bardagjy. Trussed roof structures salvaged from the former airport’s bus shelters were reused in the community garden. Photo by Paul Bardagjy. 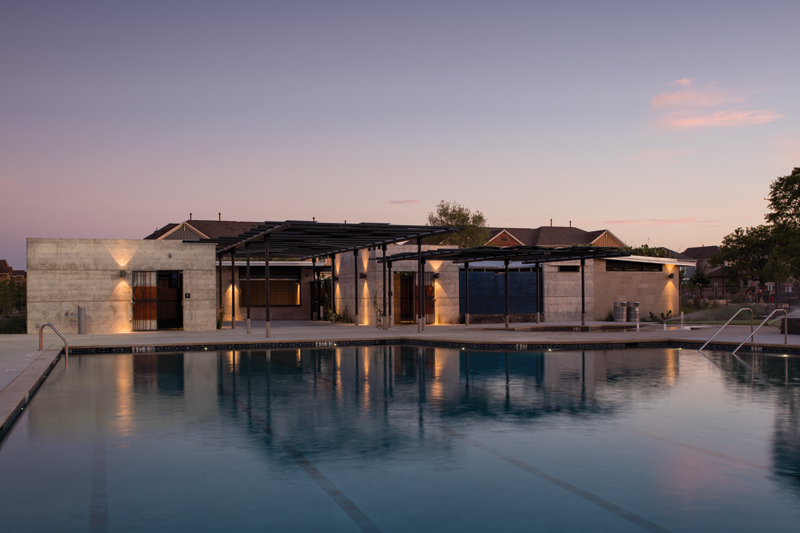 Designed by local practice Stanley Studio, the John Gaines Park and Swim Center is the second such amenity in Austin’s Mueller development — a “mixed-use urban village” that has been rising on the site of Austin’s former airport since 2002. 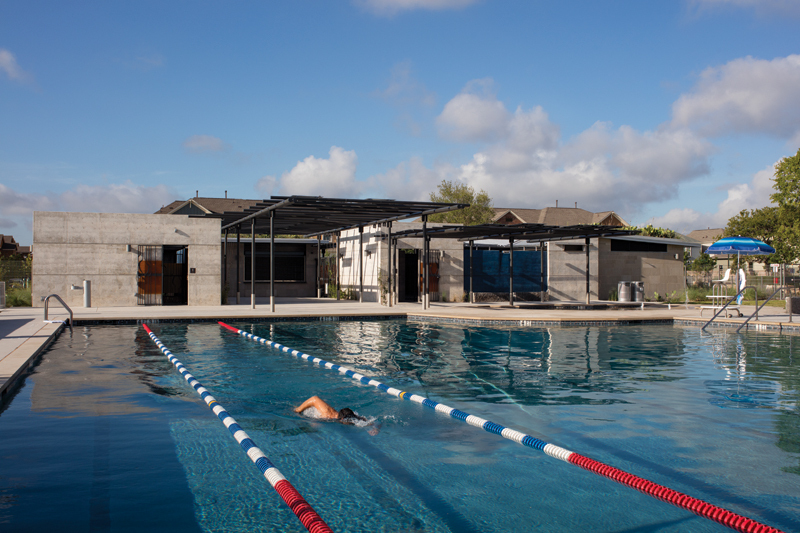 The first was the Ella Wooten Park and Pool, designed by Studio 8 Architects and opened in 2008. Gaines opened in June 2016, after a long delay caused by the Great Recession. During the economic downturn, Mueller developer Catellus suspended all construction east of the flight tower — one of the few bits of airport infrastructure that has been retained. Dampening as the recession may have been (not as bad in Austin as in the rest of the country, everybody says), it benefited the finished building. The architects were able to refine their design and re-pitch some of its key elements. The result is a project of considerable sensitivity that pays homage to the site’s former use while making visible the movement of water across the land. 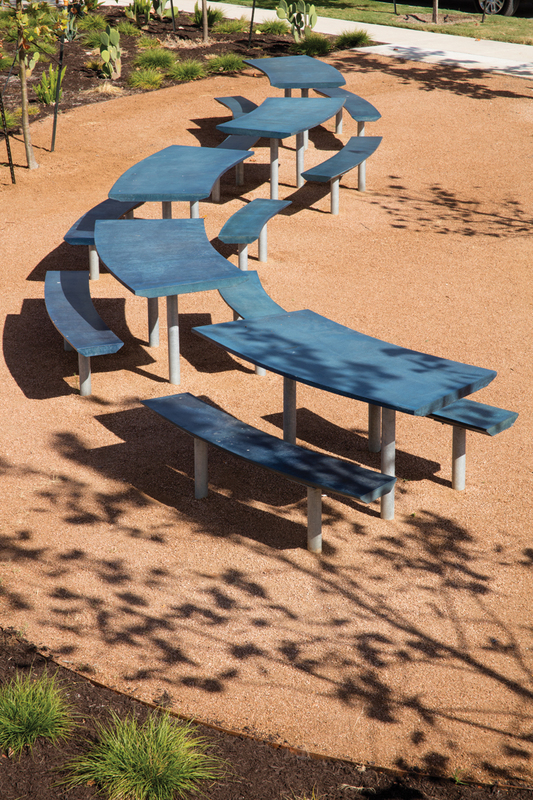 Stanley told Paulson about one of their recently completed projects — the Daniel Ruiz Branch of the Austin Public Library — and also gave him a tour of their compound, whose collection of small structures functions as a laboratory testing ground as well as a design studio. Both projects highlight Stanley’s roots in craft and commitment to sustainable design, as well as their feel for the experiential qualities of light, space, and material. It was enough to impress Paulson, who hired the architects. For Gaines, Catellus asked that Stanley follow certain guidelines established at the Ella Wooten Pool, such as the use of Leuders limestone and board-formed concrete. They also asked that the project emulate the examples set by Austin’s much-loved bathhouses at Barton Springs and Deep Eddy. Beyond that, the architects were given a long leash to indulge their own interests in sustainability, craft, and in acknowledging the site’s history. Water in particular became a motivating impulse of the architecture, not just because the project includes a swimming pool, but because Stanley wanted John Gaines to serve as an example of good stormwater management. Generally, in the Mueller neighborhood, stormwater is treated fairly conventionally — shed into drains that feed the lake and pond anchoring the development’s large park and greenway. At Gaines, Catellus let Stanley do something different. Water shedding off the bathhouses’ roofs is collected in cisterns and used to irrigate two green roofs, which are planted with a mix of succulents and re-seeding wildflowers. Overflow pours into rain gardens, where it is absorbed and released slowly into the ground. The cisterns themselves (there are two, one per bathhouse) are concrete, stained a deep blue color to indicate their function. Stanley laid out the functional spaces asymmetrically, with the two bathhouses and support spaces perpendicular to each other. A trellised breezeway separates them. 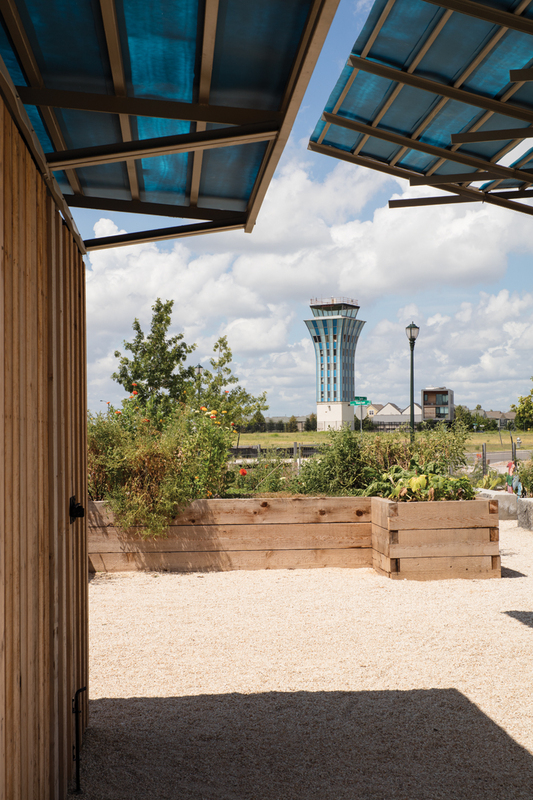 Supported on painted steel pipe columns, the breezeway is outfitted with photovoltaic panels that connect to the city grid and power the pump equipment. The density of the solar panels increases where the breezeway covers the kiddie pool, providing more shade for the youngsters. Vines planted around the base of the trellis will one day make for a shadier experience throughout. 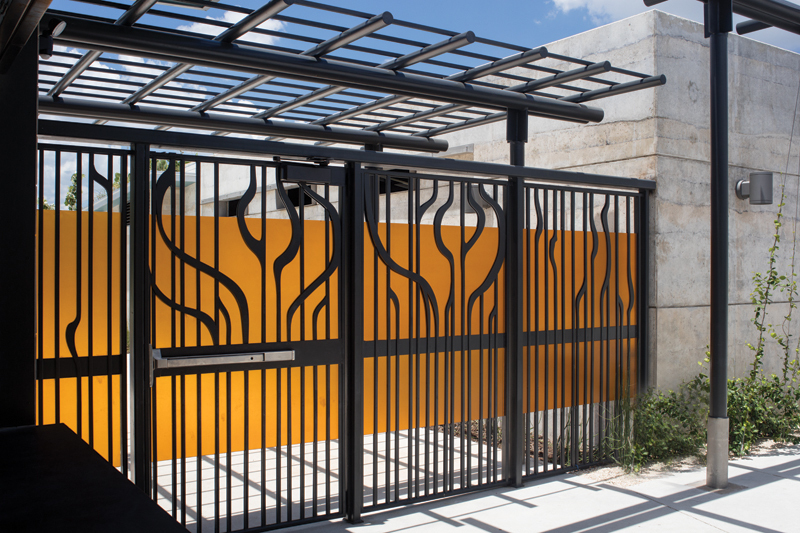 As they had done at Ella Wooten, Stanley designed and fabricated the ornamental metalwork for the project — gates, privacy screens, hardware and window grills whose swooping forms bring to mind water currents and evoke the golden era of jet-airline travel. The architects also referenced the old airport more explicitly in the park’s playground and community garden. “I thought the airport history was worth preserving,” Lauren Stanley says. 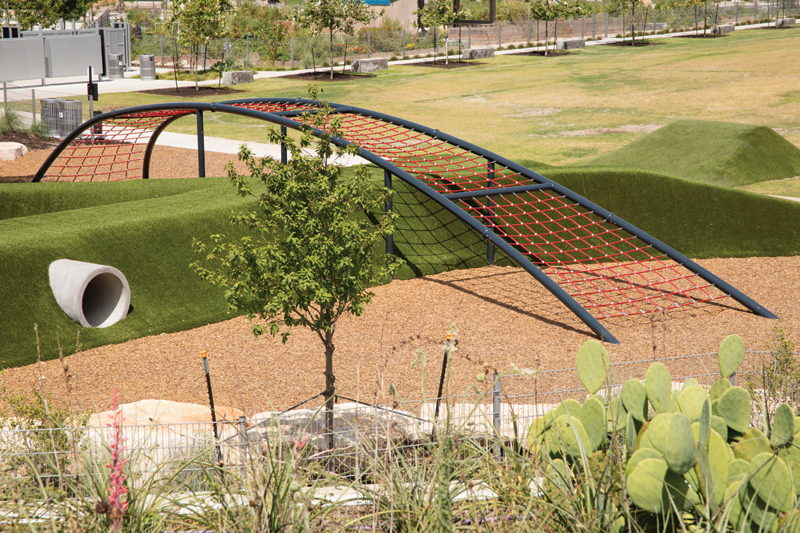 “This project is so close to the flight tower that it was easy to convince Catellus to look at a playground that was not a proprietary system, but landforms in the shape of the old runways, where children could create their own games.” Stanley covered the playground’s crossed berms in synthetic turf — a fast surface for getting to liftoff speed, but forgiving enough for hard landings — and punctuated them with concrete culverts, underpasses where the baggage cars and fuel tankers can carry on with their business while the jetliners take off and touch down above. The most direct link in the project to the old Mueller Airport is found in the community garden. With the permission of Catellus, Stanley salvaged the airport’s old metal bus shelters. The subcontractor who came out to collect them turned out to be the same craftsman who had built them in the 1980s. He cut the steel posts with a torch and used a backhoe to lift the trussed roof structures onto a trailer. Stanley hauled them off and stored them in their backyard for the long years of the project’s limbo. 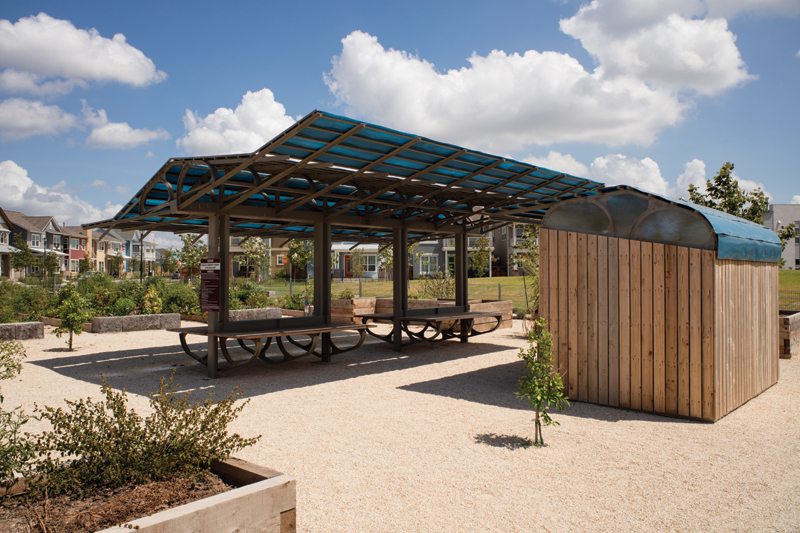 When things moved ahead again, the architects dusted off the old metal structures and repurposed them for the garden’s shade pavilion and tool shed. The beds of the garden are well defined with heavy 4-in.-by-4-in. timbers and large limestone blocks, carefully selected from a local quarry. The regimented rows are crisp and neat, in answer to the development team’s worry that a community garden would appear messy. Such a fear can certainly be put to bed now, and not just in regards to the garden beds. Gaines’ neatness, in fact its neighborliness, extends to how it controls runoff in a way that protects communities downstream. “We’re historically connected to Mueller by water,” Lauren Stanley says.